Howgate Wonder is a traditional very large English cooking apple, which has been popular amongst gardeners since its introduction at the start of the 20th century. 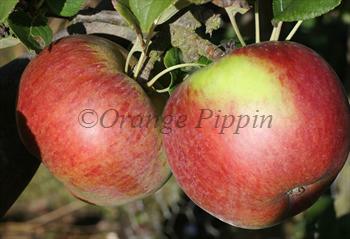 It is easy to grow, and produces good crops of large sharp-flavoured cooking apples. The flavour has plenty of tangy acidity, but it is not quite as sharp as a Bramley. When cooked it produces an attractive lumpy puree, and it can also be used for juicing. If you like an acidic apple Howgate Wonder can also be eaten fresh. Howgate Wonder apples can be stored in a cold shed and will keep until the following spring. Please fill in the details below and we will let you know when Howgate Wonder apple trees are back in stock. One of the parents of Howgate Wonder. Howgate Wonder is in flowering group 3. Howgate Wonder is partially self-fertile, but fruiting will be improved if there is a compatible tree of a different variety nearby. Since it flowers in the middle of the blossom season it can be pollinated by most other apple trees. One of the key attributes of a good cooker is that it should produce plenty of large apples, and Howgate Wonder is a naturally vigorous variety that grows into a fairly large tree - choose a smaller rootstock if space is an issue. Howgate Wonder is easy to grow and fairly disease resistant. It is also a tough tree and tolerates difficult or exposed situations fairly well. Unlike a Bramley, Howgate Wonder produces viable pollen which will cross-pollinate other nearby apple trees flowering at the same time. It is also partially self-fertile, and in most areas will produce a reasonable crop of apples even if there are no other apple trees nearby. Howgate Wonder is a cross between two traditional English cookers, Blenheim Orange and Newton Wonder - both large apples in their own right.